Eudora Broken with Dialup in Leopard, but Where to Go Next? I'm a big Eudora fan. 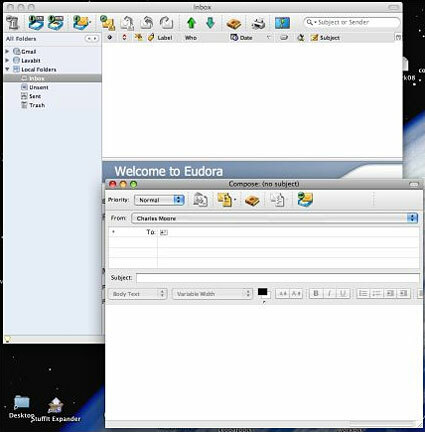 I've been using Eudora as my email software since the Internet arrived here in the late 90s, starting with version one-point-something on through to the last Mac version before Qualcomm terminated development - 6.2.4. I've tried many other POP3 email clients over the years, but in my estimation none, including Apple's own Mail, have even come close to matching Eudora's speed, versatility, ease of configuration, no-hassle support of multiple accounts, fast and powerful search engine, backwards compatibility (Eudora mailboxes created in Eudora 1.5 on my old Mac Plus running System 7 work just fine with Eudora 6.2.4 running in OS X), and a rock-solid reliability. I also prefer its minimalist interface and even keep the modest toolbar turned off. Eudora has worked beautifully with every Mac OS version up until OS X 10.5 "Leopard", and now we have problems. After installing Leopard on my PowerBook, I was dismayed to discover that I could no longer send email through my ISP email account's SMTP server, and while Gmail, which uses the Secure Sockets Layer (SSL) protocol, still works, sending is extremely sluggish. Could there be some incompatibility of Eudora with Leopard? Obviously, Eudora, on which development ceased a year or so ago, is not optimized for Leopard. Time to look for a new email client? Say it isn't so. First I tried the email module in the Opera browser. It actually worked - I could send email out, but I really don't like doing both email and browsing with the same application, and Opera Mail wants to do too much for me automatically: I want to check my accounts when I choose to and at no other time. One of the things I love about Eudora is that it gives you full manual control. The next candidate was Leopard's Mail module. I've never particularly liked OS X Mail, and my impressions haven't improved much with the Leopard version. Again, too much automation - and it wouldn't work with my ISP's SMTP server either. I began to think that the problem might not be Eudora after all. I'm stuck with dialup Internet service, slow dialup at that. The best connections you ever see here on good days are 26,400 bps. Broadband is not available, although it is promised for some time between now and the end of 2009. Cold comfort in the meantime. However, the local library, 12 miles away, maintains a WiFi hot spot, so I drove in there and logged on. Sure enough, with a high-speed Internet connection I could send mail with Eudora through my ISP's SMTP server, although Gmail performance, incoming or outgoing, was still sluggish in Leopard compared with what I'm accustomed to in OS X 10.4 Tiger (even on dialup). I should emphasize here that running in Tiger - on the same computer with the same Internet connections, using the same email software and accounts - email performance is just fine. I still have Tiger installed on another partition on my hard drive, so I can make direct, back-to-back comparisons by simply rebooting. My provisional analysis is that there is some substantial deficiency in the way Leopard is (or, more accurately, is not) optimized for coping with slow Internet connections, although it connects reliably, and browsers seem to work okay (which is a lifesaver, because I can't get attachments to send through any SMTP server using any email client in Leopard, but they go fine through Gmail's webmail interface). To further confirm of my suspicion that the problem is Leopard, I tried out two other POP3 email clients - the Mozilla' organization's Eudora 8.0 beta 2 (just released last week), and the Cocoa interface-themed Correo. A bit of back story is in order here. When Qualcomm terminated development of the classic Eudora email application, they handed off the Eudora name to Mozilla.org, whose "Penelope" development team is working on an Open Source email client to be called Eudora 8. Unfortunately, this has turned out to be a Eudora appearance-themed (sort of) face pasted onto the front-end of Mozilla's Thunderbird email client. I've never been a Thunderbird aficionado. I don't like "3-box" user interfaces, and automation his the problematic issue with Thunderbird as it is with Mail and Opera. The same applies to Correo, which is to Thunderbird what the Cocoa-themed Camino browser is Mozilla's Firefox - a more attractive and Mac-like alternative. 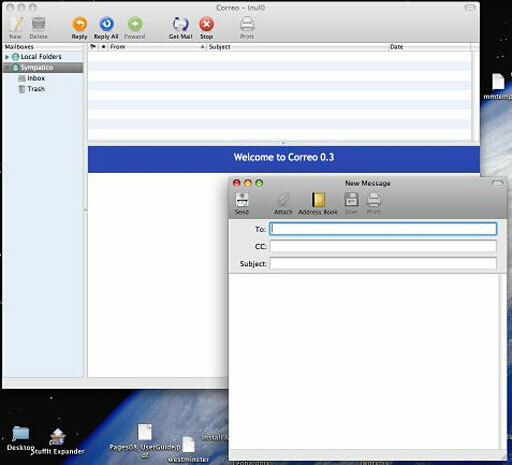 Unfortunately again, Correo is simply a pretty face grafted onto Thunderbird. All of the things I dislike about Thunderbird (aside from its Windowsy looks) - the clumsy configuration and multiple accounts management, obtuse support for multiple SMTP servers, bloated size and sluggish performance - are all present in both Eudora 8 and Correo. Also, neither will work with my ISP's SMTP server when running in Leopard. At least that pretty much confirms that the problem is Leopard and not Eudora. Which leaves me on the horns of a dilemma. I like may things about Leopard, but at least until I can get a broadband connection here, I may be obliged to stick with OS X 10.4 Tiger, which is now a mature, debugged, refined, and smooth performer. It definitely complicates my system upgrade roadmap. I have been planning to make a move to a Macintel machine in early 2008, but if I can't get email to work in Leopard over my dialup connection, I wouldn't want to buy one of the latest iteration Santa Rosa MacBooks that ship with Leopard and don't support Tiger. Perhaps version 10.5.2, expected next month, will address this problem, but I'm not holding my breath. Apple seems to have more or less thrown us dialup users to the wolves. As for email clients, Eudora still works great in Tiger, and by preference I would be happy continuing to use it indefinitely. Eudora 6.2.4 IMHO is about as close to perfection as any Mac POP3 email client has come thus far, but at some point in the future it can be safely anticipated that a Mac OS version upgrade will break Eudora (the OS X version of which is a Carbon port of the old Mac OS Classic Eudora which dates back nearly to the dawn of the public Internet), or some new Web feature will not be supported by the old application. Consequently I'm provisionally crossing my fingers and pinning my hopes on an announcement from Infinity Data Systems that they are working on a real Eudora successor that will be true to the Eudora tradition and experience. "Odysseus is the code name for the Eudora successor that Infinity Data Systems is working. We have always felt that Eudora was a best-of-breed email application for both platforms, Mac OS X and Windows. Easily one of the oldest email applications, it still offers features either not found in competing applications or, if found, not implemented as elegantly." The name is a cute touch. Even if your Greek mythology is a bit rusty, you probably have heard of Odysseus, King of Ithaca, and the protagonist of Homer's Iliad saga. Mozilla.org's Eudora Open Source project is named "Penelope", and Penelope, the daughter of Icarius of Sparta, was Odysseus' wife who waited over 20 years for him to return home to her from his Odyssey. "Needless to say, we were saddened by Qualcomm's abandonment of Eudora. And while we have the utmost respect for the Thunderbird/Eudora team, like many Eudora users, we don't believe that modifying Thunderbird to mimic Eudora offers Eudora users the features, functionality, or experience they've come to love and depend on. Its our belief that only an application written from the ground up can adequately succeed a program as great as Eudora." I couldn't agree more. The original Eudora was a work of genius, and it - not another, IMHO inferior, email program - must be the inspiration for a worthy successor. "the final application will offer full backward compatibility with Eudora, utilize existing Eudora mailboxes and settings, and offer the features and functionality that Eudora users are accustomed to, while at the same time improving on those areas where Eudora lagged behind, such as HTML rendering and OS integration." Music to this Eudora aficionado's ears.